I use to love having a house full of holiday candles during the holidays. Then I had my daughter. Now I stick to air fresheners. You can get a FREE Renuzit holiday air freshener right now with the Try Me Free Rebate. I love rebates that let me try new products for free, I haven’t tried the Renuzit holiday line but I will be making my purchase today! There are two to choose from. Purchases must be made by 12/31/2011 to be eligible for the rebate. Offers Oct 12, 2011 in free, household, mailinrebate · Expired! I don’t know about you guys but I love Lysol wipes. 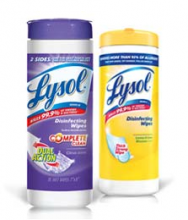 Purchase 2 Lysol products and you can submit a mail in rebate form for $3 to use towards Lysol Wipes! Get the form from Lysol and mail in your receipts from 7/1-10/31. Coupons Jul 13, 2011 in free, household, mailinrebate · Expired! Kellogg’s and Mastercard have teamed up to and are offering a $10 Gas Rewards Card when you buy 10 Kellogg’s brand cereals. Purchase 10 participating Kellogg brand cereals, download rebate form, and send in the 10 UPC codes by 12/31/2011. There is a limit of 5 offers per household. If you have a hard time getting UPC codes, ask your family and friends to save them for you. I know this offer comes at a perfect time for us, we just paid $4.19 a gallon yesterday. At the rate we go through cereal I’ll have $50 in no time! Offers Apr 4, 2011 in free, groceries, mailinrebate · Expired! Crayola Rebate Form Still Available! I posted this a while ago but with the holidays just around the corner I wanted to remind you. If you are buying Crayola products, grab this Crayola rebate form! This makes Crayola a hit this season! I love Crayola products. Especially their washable markers! My daughter just drew all over her new table and chairs and the marker just wiped right off. For those of you who will be buying Crayola products this holiday season, grab this Crayola Rebate Form. You’ll get over $20 in savings on select Crayola items!